I loaded up on heirloom tomatoes from the Mt. Pleasant farmers’ market this weekend and have proceeded to eat BLTs (sans the L) every night this week. Obsessive? Maybe. Emblematic of poor eating habits? Judge me as you will. But the tomato season is hurtling to a close and with it goes BLT season. I would rather load up now on two of my favorite things (and tempt cardiac arrest) than sit around this fall congratulating myself on my restraint. 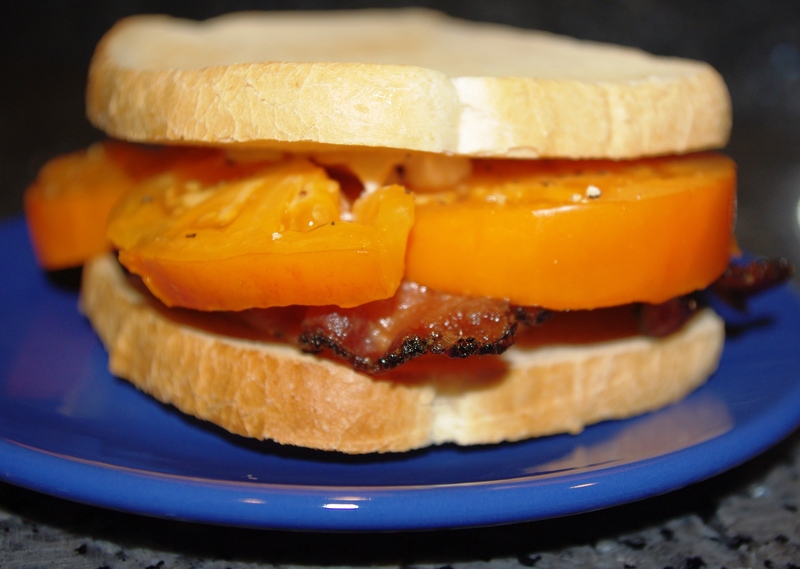 Ingredients: Toasted fresh sourdough bread, Miracle Whip (anything else is blasphemy), crispy pepper-coated bacon and gorgeous, thick slices of a tangy orange Maryland tomato. Heaven. Seriously, you love the Miracle Whip? Every time I visit my parents and see that jar sitting in the fridge, I feel sad that they are missing out on the Hellmann’s. There is something about the taste that’s just too high to me. Okay, that makes no sense, but literally it tastes upper stratosphere, as in just almost beyond my taste buds. I must have a dead food sense zone on that one. Clearly you, Lady Gaga, and Canada can’t be wrong. And Kate really likes Miracle Whip now that it comes in a squeeze bottle and she can dispense with the knife, making it even quicker to get sandwich from plate to mouth. That’s probably the relish juice you are tasting. Meanwhile Hellman’s is rotten-eggy NASTY! Whole Foods has a mayo made from canola oil that is delish, though. It’s good for dressings (Green Goddess, especially) but never, ever for a BLT.